The monthly newsletter the Petroglyph keeps you up to date on what other Chapters are doing in the State. 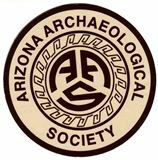 Annual issues of the Arizona Archaeologist professionaly written papers about archaeological research in the Southwest. Classes in everything from field survey to stabilization of pueblo walls, or how to make ceramics like the prehistoric peoples did. And how to read the sherd of ancient ceramics and lithics left behind by those peoples. These classes can lead to your certification in various skills needed by professional archaeologists. Field Schools in actual archaeological research locations where you practice what you learn in the classes. Becoming accomplished in the skills of reading the cleaning, classifying, and preparing the artifacts, for curation. Projects which extend the use of your archaeological skills and assist some of the the best archaeologists in the Southwest. Best of all, you get to participate in all these activities with great people of similiar interest in the great open air of the Desert, Foothills, Highlands and Mountain Forests of the Southwest. At-Large membership is for those who wish to support the Society but do not live near a Chapter. Chapter Membership is for those who wish to join a chapter in their area. Visit the Chapter Map to help you select the chapter in your area. Each chapter has membership information on their chapter page and most have a link to download their membership form. Dues are annual starting January 1. The membership fees vary between Membership Type and Chapters. make needed changes and click save. Pay with Paypal or debit or credit card. There are three ways you can join an AAS Chapter. If you chosoe to join on-line, scroll down and select the membership level; click next. At-Large Household - $40.00 (USD) Subscription period: 1 year, on: January 1st No automatically recurring payments This level of membership is available to households who live too far from any existing chapter to attend meetings or events. At-Large Member - $35.00 (USD) Subscription period: 1 year, on: January 1st No automatically recurring payments This level of membership is available to individuals who live too far from any existing chapter to attend meetings or events.